Posted on 31, August 2016 by EuropaWire PR Editors | This entry was posted in Art & Culture, Belgium, Entertainment, Media, Technology and tagged Barco, concert tour, Drake, High End Systems, rap artist, visual spectacular, Visualization pioneer. Bookmark the permalink. 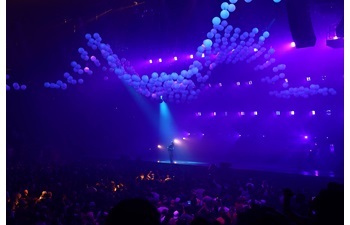 Sacramento, Calif. USA, 31-Aug-2016 — /EuropaWire/ — Visualization pioneer Barco and High End Systems, a Barco company, are providing their best-in-class AV solutions to help create a mind-blowing visual spectacular for rap artist and songwriter Drake’s current North America concert tour. The company is part of team led by world-renowned Lighting Designer Guy Pavelo and Tour Director Steve Kidd of GP-SK Design & Production. Now traveling across the United States, the Drake “Summer Sixteen” tour represents a massive undertaking in audiovisual theatrics, with the design and programming expertly directed by Pavelo and GP-SK. The artist came to the table with some highly imaginative show elements in mind, requiring a mammoth production effort: an expansive stage and set design, an 86’ curved video wall, and a Kinetic system comprising hundreds of custom LED spheres. Pavelo specified a significant amount of Barco and High End Systems gear to augment the extensive automated lighting package supplied by PRG: six MMS-100 moving mirror systems mounted on Barco HDF-W30 projectors, 66 SolaSpot Pro 2000’s, 77 SolaWash 37’s and 62 SolaWash 19’s. The SolaSpot Pro 2000 – packed full of features to empower the designer with complete creative freedom, providing specially designed long-throw optics which enable sharp focus throughout the entirety of the 8-to-45-degree zoom range, making them a perfect choice for large scale stadium shows. The SolaWash 19 and SolaWash 37 – fast, compact and versatile moving wash lights powered by 15-watt RGBW LEDs, delivering high brightness with deep hues provided by Indigo Highlighter. The Moving Mirror System (MMS) – delivers sharp, bright and incredibly detailed HD images anywhere the designer wants when combined with Barco’s high brightness large venue projectors, such as the HDF-W30. Featuring 3-chip DLP technology, single Xenon lamp illumination, and a high-contrast optical engine, the HDF-W30 makes provides ultra-high brightness, color accuracy, and stability. It is also equipped with Barco’s cutting-edge ImagePRO technology for remarkable scaling power. The Integrated Media Server technology – provides valuable creative horsepower, manipulating various aspects independently on different layers of the same content. A single output media server, it can deliver up to four layers of simultaneous HD playback and up to 10 layers of content and masks. Collage Generator™ and Curved Surface Support are also included as well as the largest library of stock content available in the market. The Barco and High End Systems team is overjoyed to contribute to the tour. “We are ecstatic to offer our latest technologies in support of this dynamic, high-profile tour and appreciate the opportunity to partner with such top-notch team AV designers and producers,” comments Scott Stremple, Vice President Entertainment Sales for Barco. The Drake “Summer Sixteen” Tour kicked off in in Austin, Texas in July and is making its way across the United States throughout the summer, culminating in Canada with shows into early October.